One of the most important things to know about your credit card is your credit limit. Your credit card's credit limit is the maximum outstanding balance you can have on your credit card at a given point in time without receiving a penalty. Managing your credit limit is important both for staying out of debt and building a good credit score. If you're wondering what the credit limit is for your credit card, check your billing statement, log onto your online account, or call your credit card's customer service. Your credit card issuer determines your credit limit when you first apply for the credit card. They will assess your income, current debt level, and credit history and set a credit limit base on those factors. If you have a new credit history, a history of late payments, low income, or a high debt level you may be approved for a low credit limit to start. Unfortunately, you won't know what your credit limit will be until you've completed your application and are approved for the credit card. (The exception is with a secured credit card where your credit limit equal to your security deposit.) If you're (reasonably) unhappy with the credit limit you've received, you can request a bigger one or turn down the credit card. Your credit limit may not stay the same the entire time you have the credit card. If you use your credit card wisely and make your monthly payments on time, you can be approved for periodic credit limit increases, sometimes without having to request a credit limit increase. Similarly, your credit limit can be lowered if your payment habits fall behind or your debt increases to a level that your credit card issuer deems risky. Some credit cards don't have a firm credit limit. These credit cars have no preset spending limit. Credit cards with no preset spending limit don't give you an infinite amount of available credit. Instead, these cards have a spending limit that changes based on your current spending habits, income, credit history, and other factors. How Much of Your Credit Limit Can You Use? 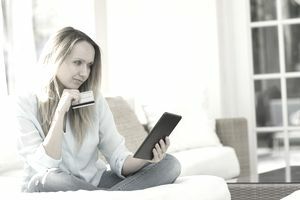 You can make purchases all the way up to your credit limit, but you may not be able to go over your credit limit, particularly if you haven't opted-in to having over limit transactions processed. Exceeding your credit limit may result in an over the limit fee and can trigger the penalty rate. Refer to your credit card agreement to see if your card issuer penalizes you for going over your credit limit. Exceeding your credit limit, and even getting close to it, impacts your credit score. Your credit limit - and your credit card balance - is reported to the credit bureaus each month with your other account information. This information is used to calculate your credit score and factors into the "credit utilization" portion of your credit score. Credit utilization measures the amount of your credit limit that's being used and counts 30% of your credit score. The higher your credit card balance, relative to your credit limit, the higher your credit utilization and the more your credit score is hurt. It's best to keep your credit card balances within 10% to 30% of your credit limit to achieve the best credit score. Your credit limit is reusable. You can use your credit over and over as long as you pay on time each month and keep your account in good standing.